• Does it deliver the right performance? • Is it reliable to ensure the uptime you need? • Is it easy to scale as your needs grow? • Is it easy to manage when you need to make changes? 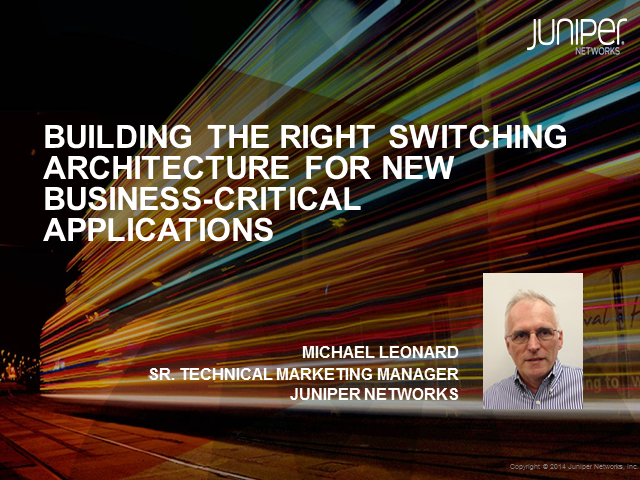 In this webinar, we will discuss switching architectures, including Juniper’s Virtual Chassis Fabric, to meet these requirements and support your business outcomes. Today’s distributed business is forcing enterprises to build new data centers, adopt clouds, and move existing servers and clusters of servers to geographically distributed locations in order to provide nonstop, reliable, and secure access to critical business applications for users anywhere, anytime. As a result, connecting and sharing these resources securely across this landscape of multi-site data centers and clouds is not a choice — it’s a requirement. But interconnecting data centers is hard, and requires close coordination across different IT teams. Virtual networking and software defined networking (SDN) only exacerbate the problem. Join us and learn more about how Juniper Network’s holistic approach to interconnecting data centers and clouds simplifies and accelerates the deployment and delivery of applications within and across multiple data center locations. Register now to attend! In this webcast, we’ll cover some of the capabilities offered by connecting networks to IT automation tools such as Puppet and Chef as well as capabilities offered by SDN solutions such as Junos vContrail. The end result will be an understanding of the questions you can ask about your data center to determine if you need to employ one or both of these technologies.